Zyban tablets contain the active ingredient bupropion hydrochloride, which is a medicine used to help people who are dependant on nicotine to give up smoking. It acts in the brain but is not the same as nicotine replacement therapy. It is not fully understood how this medicine works to help people give up smoking, but it is known that bupropion affects neurotransmitters in the brain. Zyban works by affecting chemicals and neurotransmitters in the parts of the brain that influence nicotine withdrawal. This leads to reduced cravings and fewer unpleasant side effects. Zyban is thought to work best when used in combination with other therapies, such as attending counselling or a support group. Zyban supports smokers to quit the habit but determination, motivation, and willpower are still needed. After a consultation with your doctor, you should start the course of Zyban whilst still smoking, aiming to stop completely within two weeks of starting the treatment. Tell your doctor about any medications you currently take. 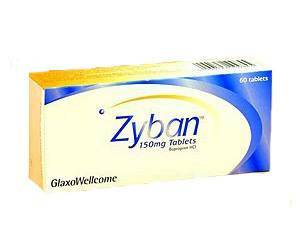 Zyban tablets are slow release tablets so should be swallowed whole with a glass of water. It does not matter whether they are taken with or without food. One tablet twice a day, ensuring there are at least eight hours between doses. Treatment usually continues for approximately nine weeks after you have stopped smoking. After nine weeks, you should stop taking Zyban; it is not intended for long-term use. If you forget a dose, do not be tempted to double up to make up for the missed dose. Instead, just take the next planned dose at the usual time. Very rare side effects iclude paranoia, delusions and aggression. Please see the package leaflet or consult your doctor or pharmacist for more information about the possible side effects of Zyban. If you are elderly (over 65 years) or suffer from kidney and lung problems, Zyban may not be an appropriate medication to take. Ask your doctor for advice. Zyban is not safe for children and is only prescribed to those over the age of 18. Zyban is also unsuitable for those who have recently experienced a head injury, alcoholics, people with diabetes or high blood pressure, and people with depression or a history of psychiatric illness. If you are pregnant or planning to become pregnant, do not take Zyban as it could harm the unborn baby. Many people find they are more sensitive to alcohol when taking Zyban so alcohol should be avoided or consumed with caution. Zyban may affect your awareness and response times so do not drive or operate dangerous machinery until you are confident that the medication does not have such an effect.